I got this recipe out of Good Housekeeping magazine several years ago. This is a great alternative for those who love chicken cordon blue but don't like all the work involved in making it. You could always add a breadcrumb topping to make it more authentic, but I like it as is. Just don't cut your potatoes too big or they won't cook through. To be on the safe side, you can always place your potatoes in a microwave-safe bowl with 2 Tbsp. water. Cover the bowl with waxed paper and microwave on high for 3-4 minutes, stirring once. Then add them to the rest of the casserole mixture. But if you cut them small enough you can skip this step completely. Preheat oven to 350 degrees. In a large bowl, whisk together soup, milk, parsley, garlic, and pepper until smooth. 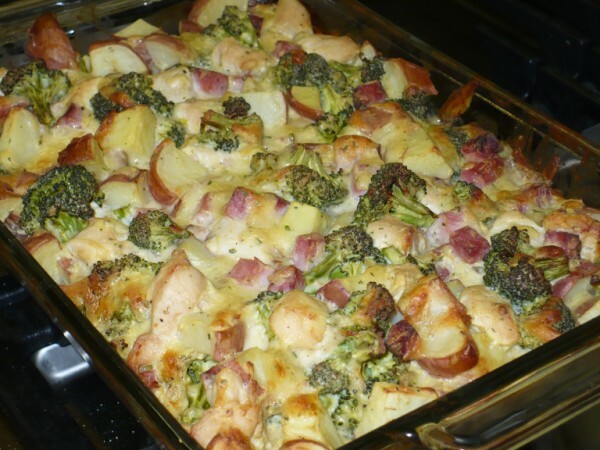 Add potatoes, chicken, broccoli, ham, and cheese and stir to evenly coat. Pour mixture into a 9x13 baking dish. Bake, covered, for 50-55 minutes or until chicken is no longer pink and cheese begins to brown.